Terrot was started as a machinery factory by Charles Terrot and Wilhelm Stucklen in Germany, 1862. In 1887, they opened their second location in Dijon, France. In 1890, the factory started to produce bicycles in Cannstadt. Furthermore, the factory began manufacturing motorcycles as well in 1902, powered by a 2 bhp engine supplied by Zédel of Switzerland In 1905, Terrot started to produce their first twin-cylinder model. 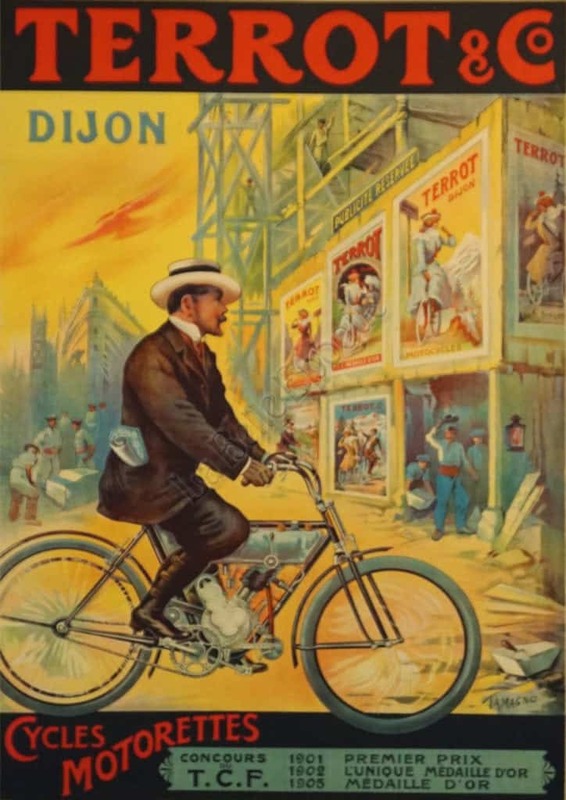 In the poster, you see the bicyclist is actually the architect (see the blueprint leaning out of his pocket) as he’s arriving to the new construction-site. The site is covered with 6 other Terrot advertising posters, very meta in that regard. On the bottom is the recent awards that Terrot earned. The background is a Yellow sky, the lettering is in Red. The bicyclist is wearing a straw hat with a black stripe.